Shared memory multi-core processor technology has seen a drastic development with faster and increasing number of processors per chip. This new architecture challenges computer programmers to write code that scales over these many cores to exploit full computational power of these machines. Shared-memory parallel programming paradigms such as OpenMP and Intel Threading Building Blocks (TBB) are two recognized models that offer higher level of abstraction, shields programmers from low level details of thread management and scales computation over all available resources. At the same time, need for high performance power-efficient computing is compelling developers to exploit GPGPU computing due to GPU’s massive computational power and comparatively faster multi-core growth. This trend leads to systems with heterogeneous architectures containing multicore CPUs and one or more programmable accelerators such as programmable GPUs. There exist different programming models to program these architectures and code written for one architecture is often not portable to another architecture. 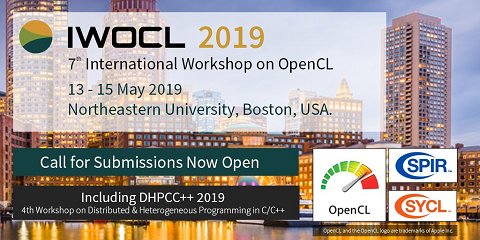 OpenCL is a relatively new industry standard framework, defined by Khronos group, which addresses the portability issue. It offers a portable interface to exploit the computational power of a heterogeneous set of processors such as CPUs, GPUs, DSP processors and other accelerators. In this work, we evaluate the effectiveness of OpenCL for programming multi-core CPUs in a comparative case study with two CPU specific stable frameworks, OpenMP and Intel TBB, for five benchmark applications namely matrix multiply, LU decomposition, image convolution, Pi value approximation and image histogram generation. The evaluation includes a performance comparison of the three frameworks and a study of the relative effects of applying compiler optimizations on performance numbers. OpenCL performance on two vendor-dependent platforms Intel and AMD, is also evaluated. Then the same OpenCL code is ported to a modern GPU and its code correctness and performance portability is investigated. Finally, usability experience of coding using the three multi-core frameworks is presented.